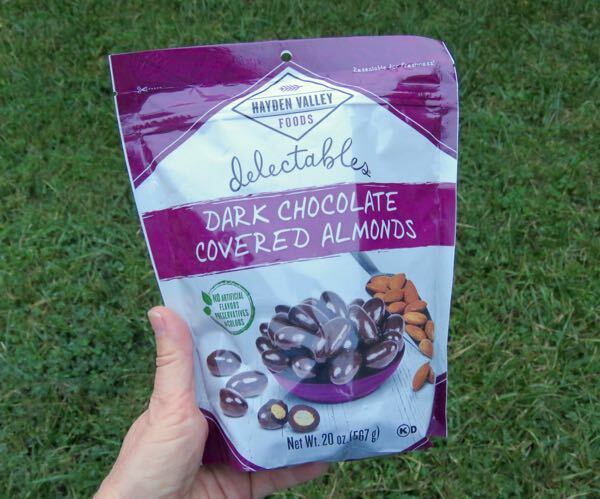 Today's Dark Chocolate Covered Almonds were from Hayden Valley Foods (Columbus, OH). 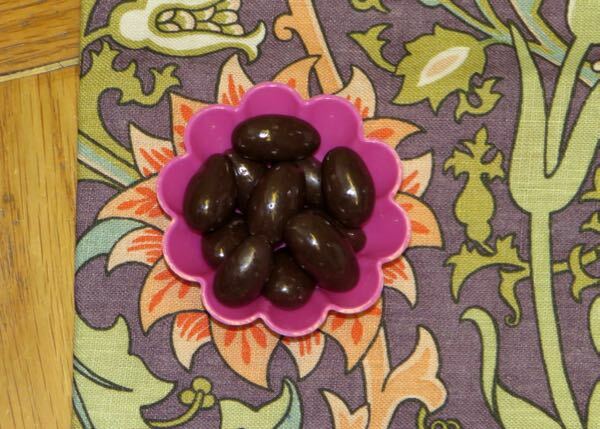 Whole almonds (with a lightly roasted flavor note) were surrounded by sweet, dark chocolate and, like most chocolate covered nuts, a shiny coat of confectioners glaze. Cacao seeds (beans) come from a colorful, (American) football-shaped fruit that grows best twenty degrees above and below the Equator. Each cacao fruit holds enough seeds to make approximately one chocolate bar. Almond seeds (nuts) come from stone fruits/drupes, that also grow on trees. However, almonds can be found in drier inland valleys in Mediterranean climates, such as California in the U.S. Each "fruit" produces just one almond, and each mature tree (depending on the type of almond) can produce hundreds of almonds—more than 40 pounds (640 oz.) in some cases—per year. Regardless of confusion over nut and seed terminology, together, chocolate and almonds can be a tasty match. Almonds add a mild flavor and crunchy, nut texture, complementing smooth, creamy milk or dark chocolates.